Need extra space around the turntable? With a high-profile, split octagonal base, the Wulftec SMH-SPL stretch wrapper offers the flexibility you’re looking for. You can customize the features and controls to meet your exact specifications, and replace or upgrade your parts at any time. Backed by Wulftec’s five-year unlimited cycle warranty, this semi-automatic turntable offers alarm signalization, maintenance-free photoeyes and revolutionary drop-away clamps. 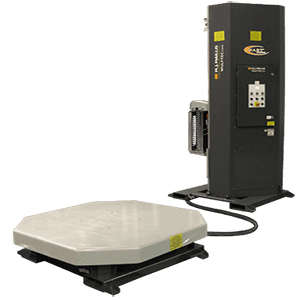 No matter your industry requirements, Hughes can help you customize your pallet wrapping equipment to meet your needs. To learn more about the Wulftec SMH-SPL Semi-Automatic Turntable Stretch Wrapper, give us a call at (609) 337-3641 or request a quote online. Never wonder who to call when downtime strikes. At Hughes Enterprises, we offer 24/7 on-site maintenance and support services. Whether you’re looking for installation assistance, maintenance or emergency support, reach out today to talk with one of our factory certified support technicians.